Do you own a personal or business website in Tyler or the surrounding communities in East Texas? 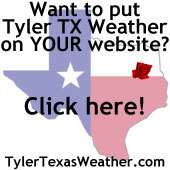 Would you like to display the current Tyler Texas Weather conditions on your site? Well, now you can!!! TylerTexasWeather.com provides free weather graphics that you can add to your website. When visitors come to your website, the latest Tyler Texas weather conditions will appear. Our Tyler Texas weather graphics are date and time stamped so users will know the weather data is current. Simply copy and paste the HTML code below the weather graphic of your choice on your site where you would like it to display. That's it! If you own a business or have a personal website and would like a custom built weather graphic with your company/website name, feel free to contact us for info. We can make the graphic any size of your choice. Just let us know. If you do use one of our weather stickers on your website, we'd like to hear about it. Please contact us and let us know the website name.